The Yankees are now 2-4 on the season, having lost both opening series, with the Baltimore Orioles and Detroit each taking two of three at The Stadium. Jonathan Loaisiga, the 24-year old right-hander entering his second season, got the start for the Yankees, and he built on how good he was last season in his brief time in The Bronx. Loaisiga opened the game with strikeouts of Josh Harrison and Miguel Cabrera in the first inning. He worked around a leadoff double to Niko Goodrum to open the second inning, and through three innings, he faced one over the minimum. The Yankees got him a lead with a run in the third inning when DJ LeMahieu doubled and scored on a single from Aaron Judge. In the fourth, Loaisiga lost his command as he walked Nicholas Castellanos, Goodrum, and Jeimer Candelario. Christin Stewart hit a sacrifice fly to deep right field to score Castellanos and tie it at 1, and that was all they got as he struck out John Hicks to end the inning. That was it for Loaisiga's day, and his final line read: 4 innings pitched, 1 hit, 1 run, 1 earned run, 3 walks, and 4 strikeouts, 70 pitches (41 strikes). "I thought he pitched well," Yankees Manager Aaron Boone said of Loaisiga's performance. 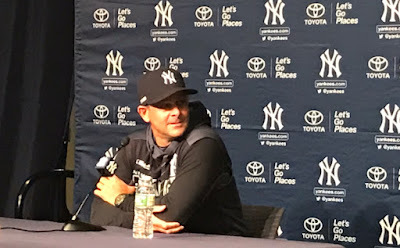 "I thought, obviously, he ran into some trouble where he lost the strike zone a little bit there, threw a lot of pitches in the fourth inning there, and would have liked to get him a little bit deeper in the game. Yankees starting pitchers have not allowed 1 run-or-fewer in 5-of-6 starts this season, posting a 2.32 ERA (31.0 innings pitched, 8 earned runs), with 31 strikeouts. Detroit's Matthew Boyd outdid Loasigia, as he threw a gem, going 6 1/3 innings, allowing 1 run on 5 hits, with 3 walks and 13 strikeouts. Boyd's 13 strikeouts are a career high, and he had the most strikeouts for a Tigers pitcher since Max Scherzer had 14 in a game at Pittsburgh on August 14, 2014. This is a new record at the current Yankee Stadium, breaking the prior mark of 12 K's, which was done three times: by the Mets' Jacob deGrom on August 13, 2018, Boston's Chris Sale on August 13 (yep, something about that date) in 2017, and the Mets' Dillon Gee on May 30, 2013. The last visiting pitcher to strike out 13 Yankees was San Francisco's Jason Schmidt on June 8, 2002, and he threw eight innings. Jonathan Holder relieved Loaisiga in the fifth, and he pitched two shutout innings, allowing just one hit and no walks, and notching two strikeouts. Chad Green came on for the Yankees in the seventh and retired Detroit in order. The first batter he faced was Gordon Beckham, Detroit's ninth-place hitter, and he hit a liner to right field that the wind took out just over the auxiliary scoreboard for a home run, and that gave Detroit a 2-1 lead. Even with Boyd out of the game, the Tigers bullpen shut down the Yankees. Buck Farmer came on with one out in the seventh and struck out LeMahieu and Judge to end that inning. In the eighth, Joe Jimenez walked Luke Voit to open the inning, then he struck out Gary Sanchez and Gleyber Torres. With two outs, Boone sent in Brett Gardner to pinch-run for Voit, and he got caught stealing. Shane Greene came on to pitch the ninth and retired the Yankees in order to earn his second save in as many nights. He has four saves in Detroit's first seven games, which are tied with Todd Jones in 2007 for the most saves to this point of a season. The Yankees got hit by the injury bug again in this one, as shortstop Troy Tulowitzki left after the third inning with a left calf strain. On Monday, the Yankees had to add left fielder Giancarlo Stanton and third baseman Miguel Andujar to the 10-day injured list. Boone said of the severity of the injury, "Low grade strain of the left calf. We'll certainly keep an eye out, but I haven't talked through it all yet," and added that he wasn't sure when the injury occurred. 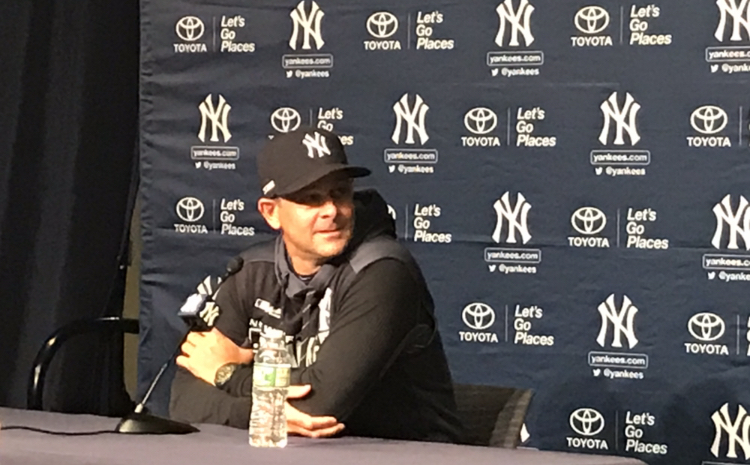 The Yankees struck out 18 times in this one, and Boone said of that high number of K's being a result of Detroit's pitching or their lineup needing to change their approach, "I mean, a little combination, obviously, the time of day makes it a little challenging seeing. They've certainly pitched us tough, but we've got to get better at controlling the strike zone, and, so, you know, frustrating that back-to-back days, we've been able to grab a lead and the pitching's been real good, but we have to step it up offensively." Boone said of sensing his hitters pressing, "I think, sure, any time, you know and that's one of the tricky spots, especially starting the season, you know, you want to get off on that good foot and make something happen, but it's such a game of just really focusing on having good at-bats, and then I always feel like if you focus on that, then results will follow. Certainly probably a case of guys wanting it too bad and that can get you in trouble sometimes as a hitter." The Yankees head to Baltimore for three games starting with the Orioles' home opener on Thursday, followed by three games in Houston against the Astros next Monday to Wednesday. "I'm really confident in our guys and we talk all the time, so we'll pick ourselves up. The Major League season is a gauntlet filled with adverse situations all the time, they come in many shapes and sizes throughout the year, even in the best of seasons. "We feel a little bit of adversity here with some of the injuries we're dealing with, but I'll hang my hat on our group and know that we'll find our way through this and get it rolling."